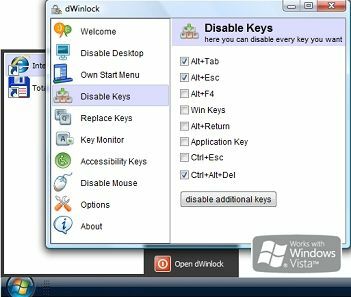 dWinlock is an easy to use toolkit which allows software developers to limit the access to Windows 32 bit systems like: 7, Vista, XP, 2k, NT, Me, 98 by disabling a variety of key combinations (e.g. Ctrl+Alt+Del) and by hiding or replacing elements of the Windows desktop (check table below with a short function overview). The dWinlock API can be used in development environments that allow for calling functions in third party DLLs. If your environment allows for calling Win32 API functions, you can also use the dWinlock API in your projects. We encourage you to download our fully functional free dWinlock trial version. The trial version includes sample source code for several programming languages, complete online-help, and a demo program with source code. Current Windows systems do not offer features that meet the requirements of these particular applications. By pressing WinKey+E, anyone can activate Windows Explorer, anytime (the risks involved in using that program should be well known). As Windows provides several comparable functions it is crucial to deactivate them when running applications like the ones mentioned above. dWinlock has been developed for this purpose. A programmer usually needs profound knowledge of the Windows system and extensive experience to be able to secure the computer system. With dWinlock, however, it has become extremely easy to achieve this objective. dWinlock runs under the following versions of Windows 32 bit: 98, Me, NT, 2000, XP, Vista and Windows 7. All options can be activated or deactivated during runtime. No reboot is required to apply changes.